Investigators say BP and the company which produced supplied the cement knew that the compound was unstable and could be vulnerable before the rig blew up. 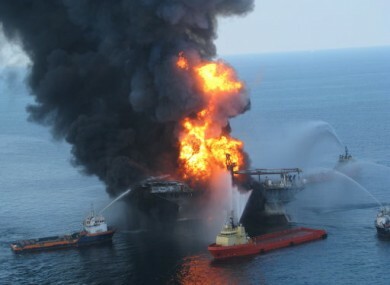 Fire boats tackle the blaze on the Deepwater Horizon, 21 April, 2010. CEMENT USED TO PLUG THE OIL WELL at the Deepwater Horizon rig in the Gulf of Mexico was known to be unstable before the rig exploded. The well should have been contained in a concrete casing before the explosion ever occurred, but investigators say tests show the concrete mixture was not stable, according to BBC. The New York Times reports that a flaw in the cement was known to have contributed to the explosion, but investigators are now saying that Halliburton, the company which supplied the cement, knew the mixture was unstable and used it anyway. Neither Halliburton nor BP acted on tests suggesting the concrete was faulty, despite tests showing the mix was unstable, according to the NYT. Halliburton has admitted it skipped an essential stability test on the final formulation of the cement mix, according to Forbes, and claimed previous tests showed the cement was stable. The company said that BP made a last-minute change by adding more of a particular ingredient. This latest report is part of a presidential commission on investigating the disaster. The rig exploded on 20 April, killing 11 rig workers and causing a huge oil leak. Email “BP knew cement used on Deepwater Horizon well was faulty”. Feedback on “BP knew cement used on Deepwater Horizon well was faulty”.